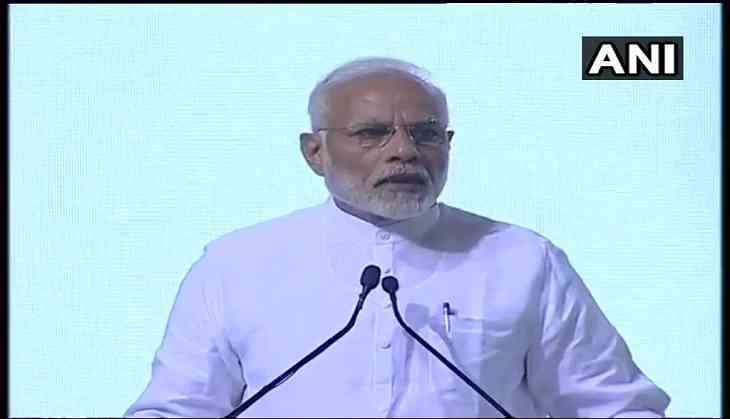 Prime Minister Narendra Modi today said he dreams of every family owning a house by 2022 when the nation will celebrate 75 years of independence, and asserted that no bribes have to be paid to avail benefits of the Centre's housing scheme. He said there is no place for the system of paying 'commission' in his government. In an apparent jibe at former (Congress) prime minister Rajiv Gandhi who had once claimed that if the Centre releases Re 1, only 15 paise reach the poor, Modi said in his government "if Re 1 goes from Delhi, the entire 100 paise reach the house of the poor". The prime minister was addressing a public gathering at Jujwa village in Gujarat's Valsad town after witnessing the collective 'e-gruha pravesh' (online house warming) of the beneficiaries of Pradhan Mantri Awas Yojana (Gramin). More than one lakh houses have been built in the state under the Centre's flagship scheme which envisions housing for all. "While talking to women beneficiaries of the Pradhan Mantri Awas Yojna, I was watching the houses behind them. Even you would be wondering how such good quality houses were built under the scheme," Modi said after interacting with some of the beneficiaries in various districts of Gujarat through video conferencing. "This was made possible because there is no place for the system of paying commission in my government. If one rupee goes from Delhi, the entire 100 paise reach the house of the poor," he said. Modi said his government has the "guts", and when the entire country is watching and the media is present, he can ask the women beneficiaries if they had to pay any bribe or commission to get the houses. "In reply, the mothers and sisters could say with satisfaction that they got the houses according to rules and they did not have to pay a single rupee bribe," he said. The prime minister said his endeavour is to ensure that every Indian family has its own home by 2022. "Gujarat has taught me a lot. This lesson has taught me to fulfil dreams within a specific time. It is my dream, it is our endeavour to ensure that every Indian family has its own home by 2022," Modi said. He said the government has given money, but along with it, these homes have been built with the "sweat of the family". "The family decided how will the house be, what material will be used and how will it be made. We did not believe in contractors but the family. When a family makes its own home, it makes it the best," Modi said. The prime minister arrived in Gujarat this morning on a day's visit and headed to Valsad. He would later go to Junagadh town in Saurashtra to inaugurate various projects, including a newly-built hospital of the Gujarat Medical and Education Research Society and two fisheries colleges at Veraval town in the Gir Somnath district, another official said. Modi would also address a public meeting at the Police Training College ground near Junagadh. Later, he will preside over the convocation ceremony of the Gujarat Forensic Science University in Gandhinagar and before leaving for Delhi, he will attend the meeting of the Somnath Temple Trust in the evening at the Raj Bhavan there.